There is only one Aylmer-related village in England, Aylmerton in Norfolk. I have visited the village, and there is no apparent reference to any Aylmer family links in the church or churchyard, although apparently there are Aylmer graves in the village of Antingham about 10km away. 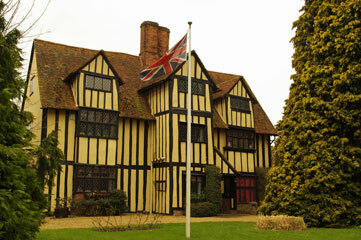 There are various Aylmer Farms, one at Tivetshall St Margaret in Norfolk, another near Harlow in Essex. Harlow also has a flourishing William Aylmer pub which I really ought to get around to visiting. My correspondent Marilyn Evans came up with an interesting Harlow link in 2015. Her great-grandmother Mary Ann Aylmer, a Norfolk Aylmer born in 1850 at Westacre, married a Henry Wentworth from a family of farmers, seed merchants and millers in Harlow. They were married there but eventually moved to Bedford. She wonders whether there might have been a link to Aylmer Farm. Also see the Streets page. A rather nice pub, the Pant-yr-Ochain, now stands on the site; its website has more detail on the family (pdf file).